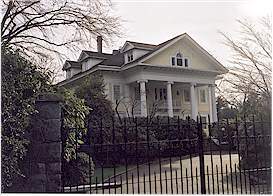 If you've never had the occasion to visit Shaughnessy, here's an activity that lures my wife and I in every time - strolling along the streets to look at the stately mansions. I admit the kids aren't always thrilled, but the flat streets are perfect for bicycling and scootering. Plus, if you time it right, your kids can collect chestnuts and acorns to their hearts content (there are millions to be had). Ours habitually fight over these nuts as if their life depended on it. And by the time we get home they practically forget to take their bag full of treasures out of the car. Anyway, while the kids are busy fighting over nuts we enjoy "window shopping" and dreaming on. The gentle maple-lined streets are perfect for those of us who balk at hills. Our two year old manages quite well on his scooter. You have to be careful these stunning mansions don't get to your head. My wife never fails to resurrect our home improvement list while all her ideas are still fresh. Last year she even went to the trouble of creating a job jar. Unfortunately, the job jar somehow got lost. It must have been Coleman. The Shaughnessy area is bounded in the north by 16th Ave., the south: King Edward, the east: Oak St., and to the west by Arbutus St. A good place to start is Osler St. which runs almost parallel with Oak, one street to the west; and then on to "The Crescent". The Crescent is a circular street with 14 gigantic homes and a beautiful green boulevard park in the middle. From the Crescent move on to Angus Drive, or Balfour Ave. Be careful if you decide to cross Granville as the traffic is heavy on this street. Shaughnessy is the center of Vancouver's old money. People who made their fortune in British Columbia's timber, sugar, mining, and other industries built a neighbourhood of homes to show off their wealth and status. It's fun to see how the other half lives. As Nathan puts it, "The only thing stopping us from moving here is winning the lottery." Questions or comments about this activity? Submit an activity idea to us?